The answer is – Metro doesn’t make that decision. Regional leadership through the East-West Gateway Council of Governments decides if and where MetroLink would be expanded, if funding is secured. There are extensions currently being proposed both in St. Louis County and in the City of St. Louis. A new request for proposals (RFP) will help the region take a look at the economic possibilities of one of those potential MetroLink extensions currently being talked about, the proposed Northside-Southside MetroLink extension. 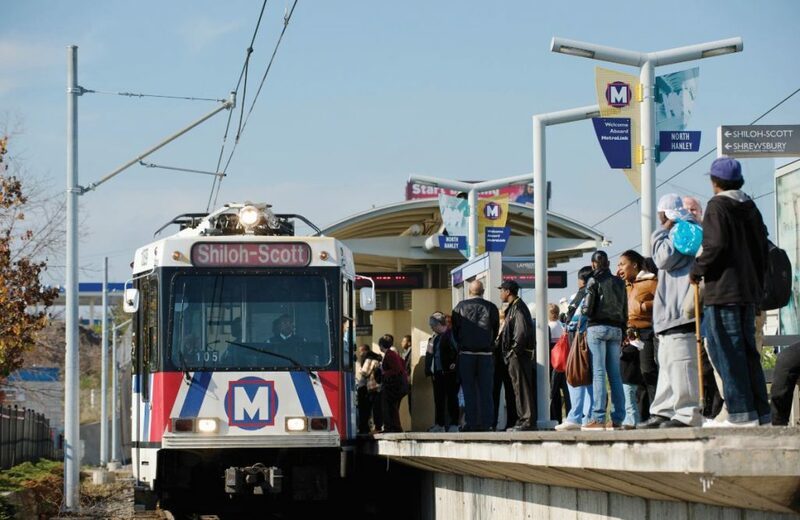 At the November 17 Board Meeting, the Bi-State Development Board of Commissioners approved an RFP for a study to evaluate transit-oriented development (TOD) along the proposed Northside-Southside MetroLink extension, including planning and policy recommendations. This study will be supported by a $375,000 grant received by Bi-State Development through the Federal Transit Administration Pilot Program for Transit-Oriented Development, which is intended to advance TOD within planned transit corridors. The study will provide regional stakeholders with the information they need to effectively plan, fund and implement effective economic development to support the Northside-Southside MetroLink project and the communities along that proposed extension. It will also explore projects that encourage accessible, diverse and multi-use development at each of the planned MetroLink stations along the light rail extension. Any type of MetroLink expansion would require significant financial resources, both at the federal, state and local levels. However, attracting private investment to support the cost of construction could be a possibility, if significant development opportunities are identified. Using private dollars to support the cost of public infrastructure projects is a financial strategy that is already proving to be successful. The Cortex MetroLink Station and Chouteau Greenway project are an exemplary model of how public and private partners can work together to improve infrastructure and transportation options for the community while supporting economic growth for the region. The project is made possible by a federal grant and private funds from the Cortex Innovation Community, Washington University and BJC Healthcare, as well as financial support from Great Rivers Greenway and the City of St. Louis-St. Louis Development Corporation. This project marks the first time that private funds are being invested into a new MetroLink station for the public transit system in the St. Louis region. The public-private funding strategy is a viable pathway toward financing future expansion of the transit system, and this study will help bring data to that decision-making process. Click here to find out more about the RFP.